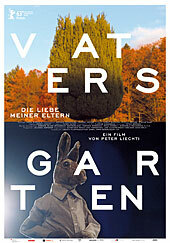 FATHER'S GARDEN is an attempt at a personal revision of the past. I had always felt like a stranger in my own family until I noticed - not without disquiet - how similar we are in actual fact. The more often I see my parents, all the more moved I am by their old age, by their gradual fading from this life, by the dying out of an entire recollective reservoir. Thus, this film does not necessarily tell the parable of the "prodigal son," but rather the "story of parents lost." My parents reject the computer, refuse to go on the "Net" and do not think "globally." Both bemoan the general loss of identity and freedom, the lack of respect and moral values in our society. They represent the typical petite bourgeoisie in Switzerland, their viewpoints are decidedly conservative. For half of my life I was convinced that I had to do everything differently than they do, also think differently and feel differently. And nowadays I catch myself with increasing regularity defending their, or rather, the "old values" against the vulgarity of present-day materialism. FATHER'S GARDEN is not merely a portrait of my parents. Rather, it is the cinematic convergence of an awareness of life, representing an attitude towards life in a bygone era. In order to express the divisiveness of my own position, the interviews and more intimate family scenes are staged as a Punch and Judy show in which the "ghosts of the past" also make their appearance. The puppet stage represents, as it were, both the home and the confines of narrow-mindedness - then as now. Interspersing documentary observation with a fictionalised family tribunal enables the creation of a very personal cosmos, conveying at all times that a person involved is giving his or her account here. A story which evolved entirely from the "synergy of an intricate encounter."